Hydroponics 101 - What is Hydroponics? Hydroponics is a subset of horticulture, and many traditional growers are still not entirely sure how it works. Have you ever seen a hydroponic system in action? It can be daunting, especially if it is a completely automated system with a high plant count. But the reality is, there is a hydroponic system for every grower, and it doesn't need to be complicated at all. In fact, once you are familiar with your hydro system, it can be less work than traditional gardening. This guide will walk you through each hydroponic system, teach you the environmental requirements for hydroponics, show you how to make your own system with just a few supplies, and prepare you for your first grow. Even if you know nothing about hydroponics, you will feel like a hydro green thumb by the end of this article. Hydroponics is defined as growing plants without the use of traditional soil or soilless mixes. Plants are houses in a net pot or cup, and roots are suspended in a hydroponic nutrient solution, or just in the air. 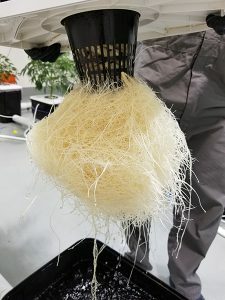 To be considered a hydroponic system, plants need to be either supported by an inert growing medium, or nothing at all. The ready availability of nutrients to the root zone is what makes hydroponics so powerful. Hydroponic systems can be broken down into active or passive systems. A passive system is one where the water does not need to be transported to the plants, such as in a deep water culture system. An active hydroponic system involves the use of a water pump or other means to move the water to the root zone, such as an ebb and flow system. The most simple hydroponic systems can consist of just a nutrient reservoir, growing medium, and a water pump to deliver the solution to the grow tray or flood table. What are the best growing mediums for hydroponics? A plant grown in clay pebbles. Click to enlarge. Rockwool is one of the most popular choices for hydroponics. It provides exceptional aeration and water retention, and anchors the roots in place very well. Clay pebbles and growstones are very similar, and are often times lumped into the same category. These are a well renowned, 100% inert media. Coupled with the fact that these are pH neutral, growstones and clay pebbles are prized as one of the best options for hydroponics. They are also reusable, and a sustainable option. Coco is used in traditional gardening as well, but there are varieties specific for hydroponics. Coco coir goes by a number of different names, and is 100% organically derived from coconuts. It features a perfect balance of drainage and water retention. 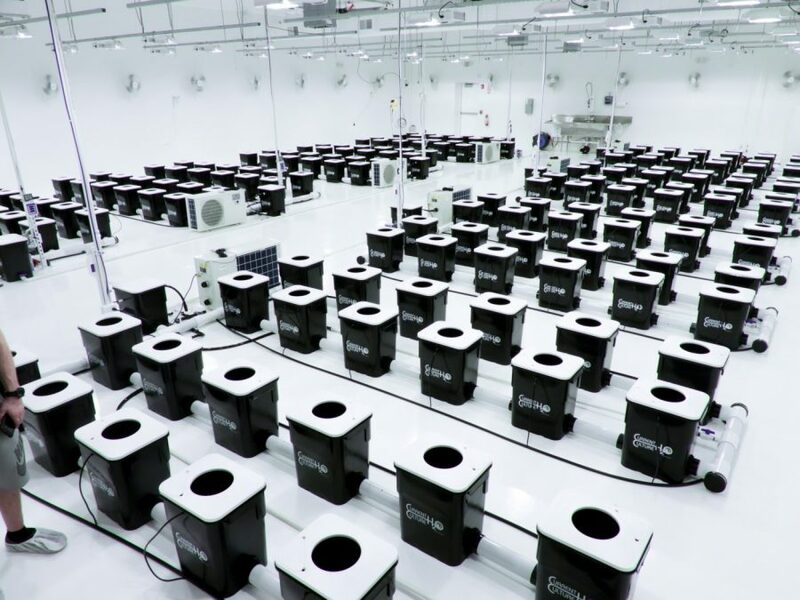 Oasis cubes, also referred to as hydroponic foam, are a popular way to start clones hydroponically. They are probably the most simple way to grow hydroponically, and support the roots very well. The aeration provided through the foam is unrivaled by any other hydroponic growing medium. If you want to learn more about the hydroponic growing medium options available to you, check out our full hydro growing medium section. Commercial hydroponic operations can be very profitable! 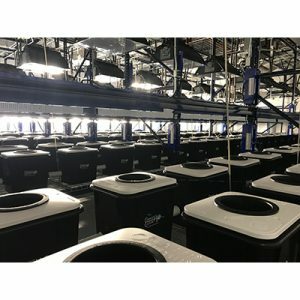 While there is a steep learning curve with hydroponics compared to traditional growing, there is a reason so many growers opt for it. Hydroponics is a more efficient method of growing, and you will use far less water growing this way. In many cases, your water can be reused to further increase efficiency. Another huge benefit of hydroponics is the accelerated growth rate you will see. Hydroponic systems will see mature plants 25% faster than traditional growing in pots. This means less time to harvest, and more harvests per year! On top of faster growth, you will also see an increase in yield. Hydroponic harvests can be up to 30% heavier than standard soil plants. The only drawbacks of growing hydroponically are price and the learning curve. It will take a while before you are comfortable operating a hydroponic system, and there is less room for error than with soil gardening. If you have never grown before, we do not recommend starting with a hydro system. The price of a hydroponic system is much higher than a standard soil garden. But look at it this way - the increase in yields, decreased time to harvest, and savings on water make it an investment! You will need to pay very close attention to the pH and ppm of your hydroponic reservoir. Since there is no soil to buffer out overfeeding, plants can be damaged. Use a high quality nutrient and pH doser to eliminate any human error! What are the best hydroponic systems? Part of what makes hydroponics so complex is the variety of systems growers can implement. 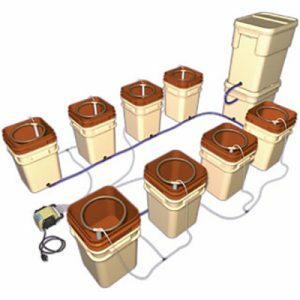 A hydro system can be anything from a primitive wick system to the most advanced horticultural method of aeroponics. There is no one set methodology that every grower must adhere to. This is what makes hydroponics so exciting. The only common thread throughout is that hydroponics is consistently a soilless method of cultivating plants. Also known as DWC, deep water culture is one of the most simple hydroponic systems available. Roots are suspended in a reservoir filled with nutrient solution. This allows for a constant supply of nutrients to the roots. DWC systems are great for those new to hydroponics, because there are few working parts. This makes the system low maintenance. The main drawbacks of DWC hydroponics is how easy it is to overfeed. Since the roots are submerged in the nutrient solution, there is no buffer to protect them. It is very important to closely dose nutrients in any hydro system, but this one in particular. This system is a little different than other hydroponic systems, as plants are fed through the top as opposed to directly at the roots. In a hydroponic drip system, drip hoses will run from the water reservoir up to the top of the grow tray. Here, drippers will slowly feed the plants. The main advantage of a drip system is the ability to control how much the plants are fed, down to each drop. There are recirculating and non-recirculating systems. The recirculating system is one where excess nutrients drain back into the reservoir, and are fed to the plants again. This is a great way to increase efficiency in your system. The aeroponic system is coupled into the hydroponic category, but it really should be in its own. In an aeroponic system, the roots are suspended in air instead of a nutrient solution like the ebb and flow or DWC. Inside the reservoir, sprayers will emit a fine mist of nutrients and water directly into the root zone of the plant. The misting of the root zone is the most efficient way to feed plants. Aeroponics is the way of the future, and there are even aeroponic cloning machines now. Part of what makes aeroponics so effective is the oxygenation of the root zone. Unlike other hydro systems, the plants do not need the help of air pumps and stones. Since they are suspended in air, they have access to all the oxygen they could need. The ebb and flow system is similar to a DWC system in that the roots are suspended in a nutrient solution, only here, it happens periodically. Also referred to as flood and drain, this system will work on set intervals and "flood" the roots with water and nutrients. The roots will be submerged for a period, and then the solution drains back into the reservoir. Ebb and flow systems combine the availability of nutrients of DWC with the aeration of aeroponics. When you decide which hydroponic system you are going to use, you will then need to find other components to accompany it. Along with the hydro system of your choice, there are certain components you will likely need. These will vary from system to system, and will depend on the environment of your growing area. Hydroponically grown plants require extra care, and at Hydrobuilder, we carry all the parts and accessories you might need. The reservoir is the most simple and easy to understand component in a hydroponic setup. 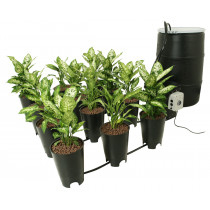 It is a tank that stores your plant’s water or nutrient solution for their feedings. In an ebb/flow or drip setup, this reservoir would have a water pump submerged within it, set to turn on at precise intervals to transport the water to your plants when they need to be fed, typically any excess water runoff would then drain back to this reservoir. You can find all our hydroponic reservoirs here. A well-aerated root zone will show impressive development! This is arguably one of the most important components in a DWC and ebb and flow system. Since the roots of your plant will be submerged, either totally or periodically, you need to aerate the nutrient solution. By using an air pump and air stone, you are able to provide oxygen to your plants. The pump will sit outside the reservoir, with the stone inside. A line will connect the two, and when powered on, the devices will deliver tiny air bubbles to the solution. This creates dissolved oxygen, which increases your plants ability to feed, while also preventing it from drowning. Click here for more information on air stones and diffusers. Since we are feeding our plants water directly at the roots with no buffer, it is important to pay close attention to the quality of this water. Filtering the water before it gets to the reservoir will ensure all harmful particles are removed, and you are in control of what you give your plants. 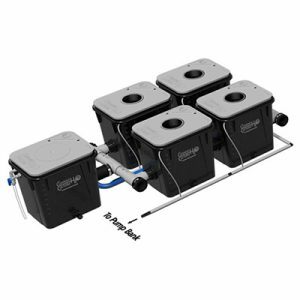 Reverse osmosis filters are the best way to filter for hydroponics, because they provide two steps of filtration. The first filter removes large sediments that could harm plants. The second filter is a semi-permeable membrane for tiny particles. Another common method of filtering water is with a dechlorinator and sediment filter. This is especially important in locations where local water contains many chloramines. Chloramines are put into the water to kill bacteria so humans can safely consume it, but chloramines can actually harm plants. For this reason, it is important to filter them out before feeding. Dechlorinator and sediment filters filter out chlorine and chloramines, and then sediments. Check out our full guide to filtering water safely. If you live in a particularly warm or cold climate, you will likely see temperature fluctuations in your water. The root zone is a very sensitive part of the plant, and it requires very specific temperatures. Try to keep the water in your hydroponic reservoir between 65-70 degrees Fahrenheit. If temps raise too high, plants will be unable to hold onto dissolved oxygen. This can affect their ability to absorb nutrients. If temperatures drop too low, the plants will get shocked, and stop growing. If either of these situations is a possibility in your climate, you will need either a hydroponic water chiller or heater. Here is some more information on why hydroponic water temperature matters. Since plant roots are constantly exposed to the nutrient solution in our hydroponic system, you need to make sure pH and ppm are within the optimal levels. A pH meter will help you determine if you need to raise or lower your pH with a pH adjuster. The optimal pH level for hydroponic water is between 5.5-6. 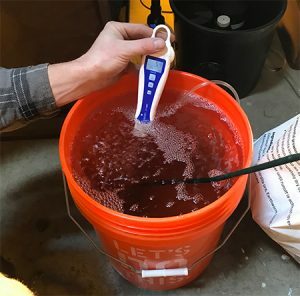 If you want to learn more about measuring and adjusting pH, check out our full guide. PPM meters indicate the concentration of nutrients in your water. This will indicate if you are under or overfeeding. You will have different requirements for ppm depending on whether you are in veg or flower, and your nutrients should provide a guide of this. To adjust your ppm, add more water or nutrients accordingly! Do you have a spare room in your house that you don't mind making a mess in with your hydroponic garden? 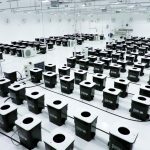 Does that room have the proper temperature, humidity, and ventilation requirements associated with hydroponic growing? But odds are, you do not. And these are all very important. 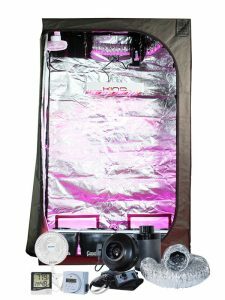 Luckily, hydroponic grow tent kits hit on every aspect needed to cultivate strong, healthy plants in a safe, private environment. And many more growing accessories! If you want to learn more about growing in a tent, visit our full grow tent section. How do you build a hydroponic system? Want to try and put together a DIY hydroponic system? This can actually be pretty simple. Keep in mind this will be a very primitive hydroponic system. 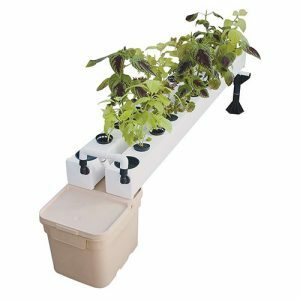 An active hydroponic system will always be more effective but if you are looking for a cheap way to dip your toes in the water, this will work. First, you will need to cut a hole in your lid to match the size of your net pot. Then, you will put the net pot in the lid (with growing media) and measure where you want your water line to be in accordance with this. The water line should reach the bottom of the grow medium and keep it moist, but not soaked. Then, put your air stone in the bottom of the bucket and connect it to your air pump outside the bucket. You are now ready to go! Anchor your plant in the net pot and let the root development begin. You will need to regularly check pH and ppm of your nutrient solution, and adjust accordingly. Add fresh water every other week, or sooner. 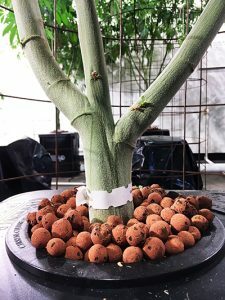 By now, you should have an understanding of the different hydroponic systems, and important considerations for growing in them. The key to hydroponics is precision with nutrient dosing, and you are in full control of how you feed your plants. If you are new to growing, check out our learn to grow series. This is a 7 part guide on how to start your grow with absolutely no prior knowledge or experience. For more information on growing hydroponically, visit the hydroponics section of our learning center. If you have any questions, our expert growing staff can assist you at 888-815-9763!